I first read this as a school text, when I was about thirteen, I think. I remembered it as having rather blown me away at the time, but truthfully because of the Boxer storyline rather than the politics. At that time – the early ’70s – here in the UK, public opinion had largely caught up with Orwell’s interpretation of the regime, and the USSR was seen by the majority as evil and scary, with it and the US facing off against each other over Europe’s head, each building bigger and bigger weapons. (There was a fairly significant minority view, too, that the USSR was indeed successfully socialist and a good thing, and that anyway, whether it was or wasn’t, pacifism and unilateral disarmament were the way to go.) So the message of the book wasn’t really shocking or new as it may have been to those first readers back just after WW2. Now, another 40 years on, older, possibly more knowledgeable and certainly more critical, I found I had some issues with Orwell’s portrayal. 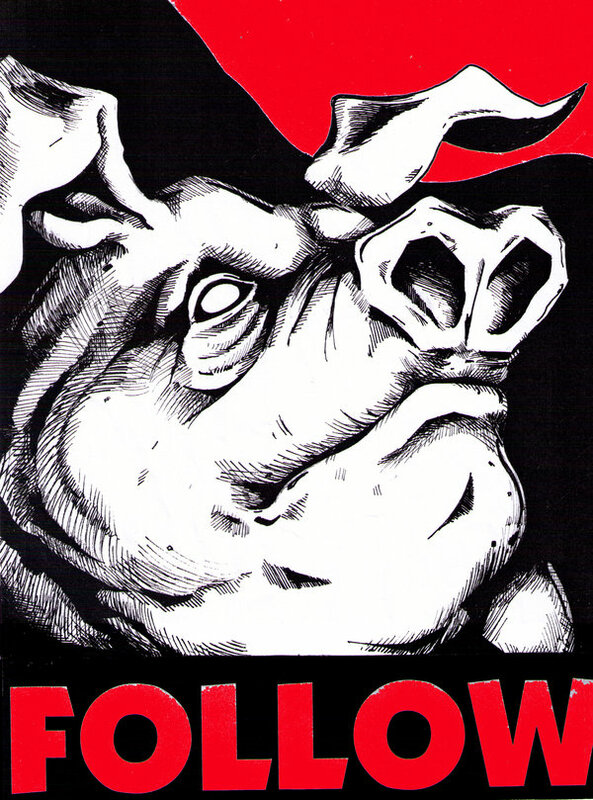 The reason Orwell gives for the pigs becoming the leaders is their intelligence. The other animals are fundamentally stupid. Is that, then, Orwell’s view of the leadership and people of the USSR? Are the leaders all brainy while the proles are basically thick? It’s not simply that the other animals are uneducated – in the first flush of enthusiasm after the rebellion, all are given the opportunity to learn to read, but only the pigs and the donkey succeed. Poor old Boxer the horse, the backbone of the revolution, hardworking and utterly loyal, never manages to get past ABCD in learning the alphabet. I fear it smacks of a kind of utterly misplaced intellectual elitism to me, a suggestion that those who become totalitarian dictators do it through superior intelligence. Later, the pigs resort to intimidation, misinformation and propaganda, but not till after the intelligence/stupidity divide has allowed them to take a stranglehold on power. But there’s another aspect to it too, which sat uneasily with me. In this fable, all intelligent animals become corrupt despots, while stupidity seems to equal loyalty and a sense of fairplay and sacrifice. My second problem is with the idea that the pigs become more humanlike as they become more corrupt. Assuming Farmer Jones represents Czarist Russia, then OK – I can go along with that for the sake of the fable. But if you factor in the other humans on neighbouring farms, with whom the pigs sometimes form alliances and at other times fight, then presumably these other farms represent the countries neighbouring the USSR. So, if the humans in the allegory represent corrupt leadership, the message seems to be that all leaders of all forms of government are corrupt and abuse their proletariat just as much as the USSR does. Even if for the sake of argument one accepts this as true (which I struggle to do even hypothetically), I can’t help but feel it means Orwell undoes his own argument about the unique corruption of power in the USSR. If democratic governments are just as bad as totalitarian ones, then… what’s the point he’s trying to make? Orwell says in his introduction that he didn’t mean for the pigs and humans to appear to fully reconcile at the end, and indeed they don’t, but they have become so similar that it’s hard to say which ones are the more morally or politically acceptable. In summary, I really preferred the book when I was twelve, when the simplified allegory and emotional appeal of Boxer’s story worked better for me. My adult self found it a bit too simplistic and reliant on the reader not making any serious critical analysis of the underlying messages, when it all begins to lack coherence. An interesting and cautionary re-read though, especially in this troubled time of “fake news” and “alternative facts”. I know what you mean about the ‘elitism’ of the clever pigs, although I suppose the Soviet way of dealing with any other clever people was to silence them via gulags or assisted suicides or the like. And you are probably right that Orwell clarified and developed his ideas further for 1984, so some of the things in Animal Farm are not quite thought through carefully. However, I am almost beginning to agree with him about the other humans and farms, as I see more and more that nearly all governments in the world are full of self-interest, corruption, all about serving the interests of a small part (usually the more extreme part) of the electorate and so on. I suspect the examples of ‘appeasement’ and Realpolitik disgusted him, which is why he lashed out in the book. It may be exaggerated, but the frustration is understandable. Ah, yes, I see what you mean – of course, in their own perception… the countries that have Democratic in their name (or People) are usually the ones that are least democratic. A brilliant review of the book, FF, I must say. Like you, I haven’t read this since my early teens and I also remember it striking me as extremely clever and effective. I think I shall have to read it again having read this, the points you make are superb. Perhaps Orwell was overtaken by his own emotive views of the revolution and so we have this quite simplistic and frustrated presentation of the revolution. Funnily enough, the part I remember most clearly about this book (apart from poor Boxer, who broke my heart!) was when the pigs got into the farmer’s drinks cabinet and a statement was issued the next day that Napolean was close to death. later in the day it was announced that he might indeed survive and by the evening he was actually going to be fine. Whenever I have a hangover, I think about this bit in the book! Interesting review, thank you. Some good points – Orwell was a boyhood hero of mine but I also found that when revisiting his novels that there are some difficult undertones, such as his patronising attitude to the working class, not to mention his homophobia, that haven’t survived the passing of the years. In some ways, FIctionFan, this book is getting more and more relevant as time goes on. I know what you mean about the pigs – I do. And I can understand how 1984 was a little more sophisticated in ways. But this one does have an awful lot to say, I think. Thanks, as ever, for an excellent review. Tragically so, Margot – especially the corruption of history and “truth”. I do think this one is still a good introduction to the subject, especially for teenagers, but I’m glad he filled it out more in 1984 – this one feels almost rushed, as if he hadn’t fully thought his ideas through. Great review. You made some good points, FF. So did the other commenters. I haven’t read this book since I was a teen. I wonder if my view of it would change as well. You’ve given me food for thought FF. I haven’t read this since I was 12, when I found it very affecting. You’ve made me realise I’m well overdue for a re-read, maybe I would have quite a different experience of it now. I think it’s a combination of me being older, which meant the whole Boxer thing didn’t affect me quite so much, and just that the world has become a much more cynical place in the intervening years. There was still a kind of post-war idealism when I first read it, and a belief that socialism/communism could work. Now we seem to have rejected all our political systems but haven’t worked out what to put in their place… oh dear! Give me chocolate, quick! My father gave it to me to read when I was quite young. I read it several times. I was too young to understand it the first time but I found it kind of scary. Because I read it as a school text, we were told what it meant as we read. I’m afraid the message is still scary – the last year has certainly shown how people allow themselves to be influenced by “fake news” and propaganda, I fear. Life is scary almost everywhere and getting worse. And there really is no where to get away from it. I keep telling you… Mars! I can’t go far until my doctor gives me permission. She hates cats. She was raised in India and has high cast. 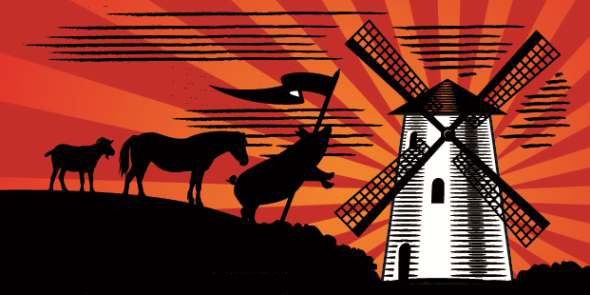 I first read Animal Farm when I was 12 too…because I liked stories about animals! I had no idea what it was about and found it confusing and a little scary and then my dad sat me down and I learned about the Soviet Union for the first time. When I read it a couple of years later in school, I got a lot more out of it but I wonder what I would think of it now. I just remember being shocked because I was expecting a sweet story about animals on a farm and the allegory was completely over my head! My dad has a background in Russian history so he was able to set me straight once he realized what I was reading! I, too, read this one when I was about 12 or 13, and I remember enjoying it on the level of an animal story. I haven’t re-read it since and I’m not sure I want to! It always made me a bit exasperated when my English teachers demanded we analyze what we read to death, forcing interpretations, pigeonholing characters, and so forth. Guess I’m just a simple person at heart! Great critical review, FF. I read this book in my late teens and remember having similar problems with the message of it. I think this is a book that perhaps needs to be read in its historical context for the message to work. Maybe sometimes a message has to be simplistic in order to be heard? What a scary thought, especially at a time when many people’s attention span doesn’t last past 140 characters. Great review. I too read this for the first time in my early teens, when the Cold War was still happening around us. Reading it as an adult, I have to agree that it was a pretty simplistic presentation and nowhere near as effective as 1984. I always thought Orwell was a snob, and much more of a despiser than an admirer. The man could write though! I loved this as a teenager but I suspect I didn’t really understand it at the time and would feel differently about it if I read it again now. That’s always the risk with re-reading books after such a long gap! 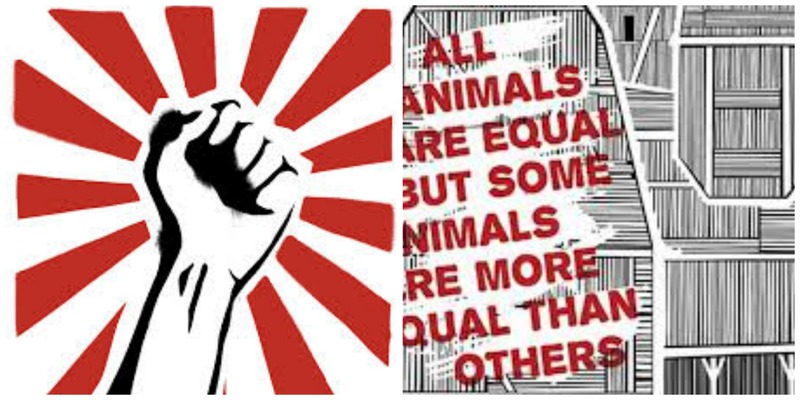 I’ve read some of Orwell’s lesser-known books recently – Coming Up For Air and Keep the Aspidistra Flying – and enjoyed both, but they are very different from Animal Farm! Wow, very impressive and comprehensive review! Now you have me wanting to re-read this one to see how my opinion of it may have changed, which it most likely has. Hmmm, must re-read this, and Animal Farm. I read this as a school text too, same as everyone else it seems… Poor Boxer. 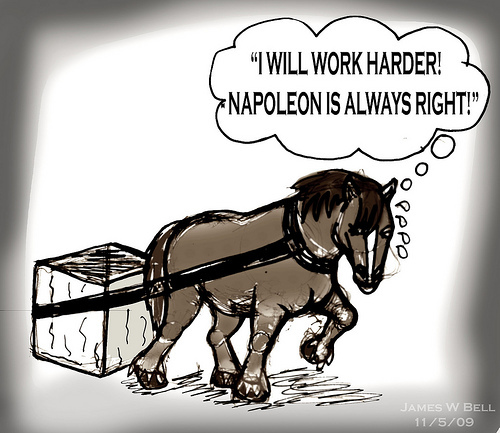 “Must work harder” was sad. I see someone else suggested reading other work by George Orwell too. Seems like a good idea, as I have only read this and Animal Farm. I suspect his non-fiction could be too dry for my taste. Yes, of historic interest only. Well I do think that what he was saying about the Soviet Union was quite revolutionary at the time – and more directed to comrades on the left than to right wingers or those wanting reds under the bed ammunition. This had all started from his experiences a decade earlier in the Spanish Civil War. The SU was at the end of the War the totalitarian system left standing, so it was the one to write about. As you say, we have a different pig in power now. Very interesting review, FF! I was wondering how well you were going to receive this in light of events. Perhaps you’re right — better for a younger mindset. I’ve been using the term “alternative facts” daily now to fit the narrative of my choice. My scale in my bathroom is definitely using alternative facts! And now my kids have caught on, using alt facts to explain missing cookies. Where does it end?! I’m instructing them to reread Animal Farm this instant! Egads! The Bowling Green Massacre today, the alt facts everyday… I can’t keep up with her brand of crazy! How does she even keep track of her spin? Perhaps it explains the knots in her hair and the haggard look in her eyes… I have an impeachment ticker going on my computer… it’s the only thing keeping me sane. I’d love that daily feature! T doesn’t read books, so it’s safe to say a book review site is the perfect outlet! No Twitter war threat. I hope Theresa May sterilized her hand since her last visit. Although there’s not much to grab, she did need to guide him down the scary, spooky steps. She looks worse every day doesn’t she? She changed so badly after the election, I wondered for a bit if she’d suddenly realised what she’d done and was regretting it, but she seems to have bought in to the whole thing again. I almost hate her more than I hate Trump – almost! I didn’t get to read it ‘on my own’ the first time, since it was a school text, so we were made to be aware of the politics as we read. But even so, the whole Boxer story broke my heart! It didn’t so much this time – I’ve become so old and cynical… He was kinda horrible about the cat, though! T&T were most annoyed! I would totally love to read a rewrite of Animal Farm told solely from the cat’s point of view. What the hell was he doing all that time? What did he see?? What did he know?? ?